These classes prepare children and youth who are not baptized to receive the Sacraments of Initiation at the Easter Vigil. Children in elementary school or in junior high or high school learn their prayers, the most important truths and principles of our Catholic Faith contained in the Apostles’ Creed, the Catechesis on what we must do, summarized in the Ten Commandments, and on what we must receive, the Sacraments. The focus for these classes is on the Sacraments of Confession or Penance and the Holy Eucharist. Starting in 7th grade and up to 11th grade, youth may start their Confirmation preparation. Our two-year program focuses on a thorough and solid teaching on the principles and truths of the Catholic Faith to equip the candidates with the necessary tools to become true disciples of Christ able to give true witness of Him through word and example. In addition, we strive to guide our candidates not only on their knowledge of the faith but also on their living the faith through the decisions they make. Registrations for Sacramental preparation for the Catechetical year 2018-2019 will open soon. 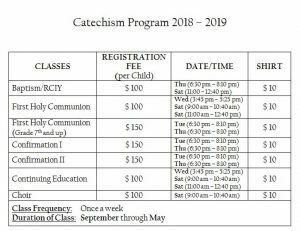 Registrations for the Catechetical year 2018-2019 will open on August 21, 2018.